Given the very positive feedback of the participants last year, the Summer Experiential Programme in Beijing (Yao Class) ran again in 2017 during 26 June – 14 July 2017. 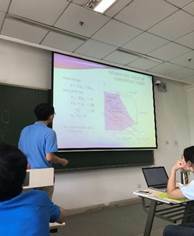 The organizer, Yao Class of Tsinghua University, offered two summer courses titled “The Physics of Information” and “Theory and Practice of Modern Information Technology” to our students. A group of 20 students participated and reflected that the courses were very challenging but motivating. The hard work and solid foundation background of Yao Class students impressed them most. By travelling around the city after class, they knew more about the historical background of Beijing and the lifestyle of Beijing people. All of them rated it an unforgettable trip.